The shopkeeper might have been racist, but he was also clearly terrified. He told August that Hattiesburg’s Reformed Rabbi had been “run out of town” the previous spring. Once, the shopkeeper bought some bullets at a local hardware store, and the man behind the counter said, “I didn’t know Jews had guns.” This was the same man who had been stalking August that summer, and who was known to be a member of the Klan. 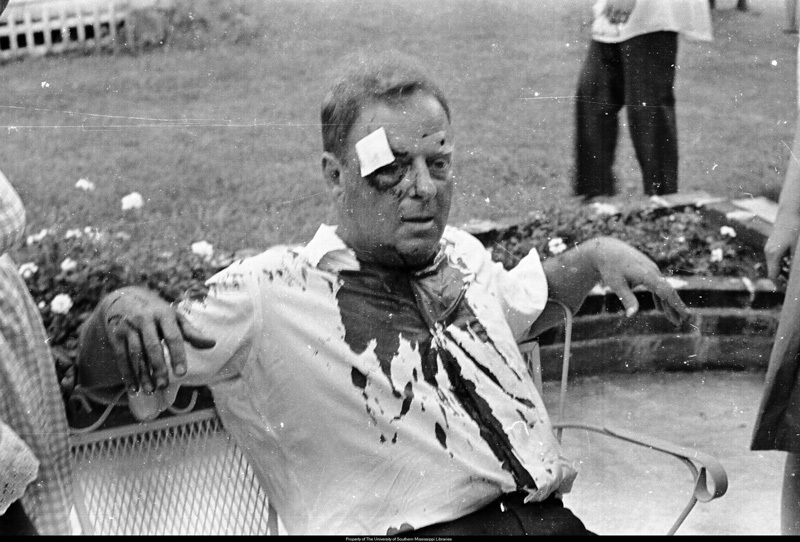 A year earlier, Rabbi Arthur J. Lelyveld from Ohio faced a brutal beating in Hattiesburg. 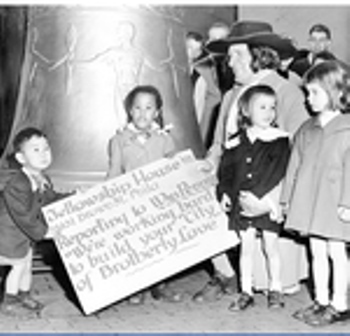 Lelyveld was in town to take part in the 1964 Mississippi Summer Project answering a call for volunteers to work on voter registration and teach at informal Freedom Schools where the curriculum could range from Black history to typing to conversational French. After his training, one of those Freedom Summer volunteers, Andrew Goodman, joined longtime activists Mickey Schwerner and James Chaney to investigate a church burning in Neshoba County, 120 miles to the north. Chaney was a black Mississippi native. Goodman and Schwerner were white, Jewish New Yorkers. The three disappeared early in the summer; their bodies were discovered two months later. Their murders drew the attention of the country to the struggle for voting rights in Mississippi. We make much of those Jewish volunteers. Yet would they have made much of being Jewish? On the application form for Mississippi Freedom Summer, prospective volunteers were asked to list affiliations.Andrew Goodman left that section blank. There was no mention of a synagogue or youth group. In fact, there was no place to indicate religion on that application. Much has been written about the disproportionate number of Jews who took part in what its veterans call “the Movement”—figures range from fifty to sixty percent of all white activists– but there’s no true way to track that number. Certainly, we can’t know how many did their work consciously as Jews, or associated it, at the time, with Jewish values. For Yosaif August, now 70 and living in Elkin’s Park, the call to work in the Movement felt personal. He had witnessed Mississippi activists like Bob Moses, who was coordinating voter registration in counties where that work could get you killed, during the 1963 March on Washington. He had heard Fannie Lou Hamer, the share-cropper and legendary organizer, speak about trying to register to vote, and the countless beatings she received for her efforts. For August, Mississippi was a test of his own courage, “the baddest place” he could think of. On the other hand, for Ellen Tichenor, Movement work wasn’t a test of courage but a rejection of what she calls “Jewish particularism” — a tendency to see struggles as only by or about Jews. Tichener, 68, currently lives in Upper Roxborough and grew up in Philadelphia, and as a student at Girls High, she found herself involved in the folk music scene of the early ’60s, attending house concerts by the likes of Pete Seeger and Dave Van Ronk. 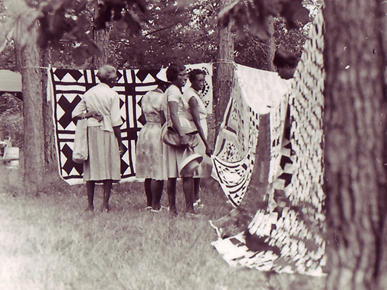 When Tichener became friends with black girls, her mother let her know that it would create problems in the white, Jewish neighborhood if she brought them home. Still, when she went to Temple University, her parents allowed her to move into “Little Fellowship House” a church-affiliated storefront in the heart of North Philadelphia. She lived there with Diana King, a black activist, registered voters, and taught music in the Freedom School. In late August of 1964, while Tichenor was out of the city at the Fellowship Farm near Pottstown, she got a call from her housemate. A rumor had spread that the police had shot a pregnant woman, and anger had erupted in the streets around Temple. The ensuing three days of looting and violence, known as the “Columbia Avenue Riots”, resulted in hundreds of casualties and arrests. Tichenor compared what happened to a pressure cooker. “Literal heat, political heat, economic heat — they blew the lid off.” Tichenor spent the weekend working with local clergy and community leaders to contain the violence, supporting a summit between gang members who called and enforced a temporary truce until the situation was under control. Altogether, of the 170 businesses in the five-block radius at the center of the riot, only 50 were spared, and almost without exception, those 50 were black-owned. But Tichenor remembered that they didn’t touch the storefront of a local dry cleaner, “Art Russikoff, the nicest guy, who believed in equal rights — and always cleaned our stuff for free.” Still, many of the affected businesses were owned by Jews, and Tichenor believes that Jews were a convenient target because they were closer to Blacks in status, and visible. If blacks couldn’t get to the real power structure, they would express their anger at whatever was close at hand. That same week in August, while Tichenor was working to keep peace in Philadelphia, Arthur Waskow was in Atlantic City’s Boardwalk Hall, lobbying to seat the Mississippi Freedom Democratic Party at the Democratic National Convention. His integrated group of delegates had come to the convention to challenge Mississippi’s all-white delegation. Waskow was a Fellow at the Institute for Policy Studies in Washington, D.C., a “freestanding place for thought and action” that was started by former aides for the Kennedy administration and former Congressional assistants disillusioned with Cold War politics. Waskow recalled that Martin Luther King, Jr. led the efforts to seat the delegates. Although he arrived with a broken leg, in stifling heat and on crutches, and he led each member of the committee to a room and spoke to them individually, a process that Waskow described as “some of the hardest work I’ve ever seen anyone do. I was deeply impressed — even more than by his speeches.” Meanwhile, the Freedom Democrats marched up and down the boardwalk, led by Fannie Lou Hamer, singing freedom songs straight from the book of Exodus, but with new words taken straight from the Mississippi struggle: Who’s that yonder dressed in red? Must be the children Bob Moses led! Rev. 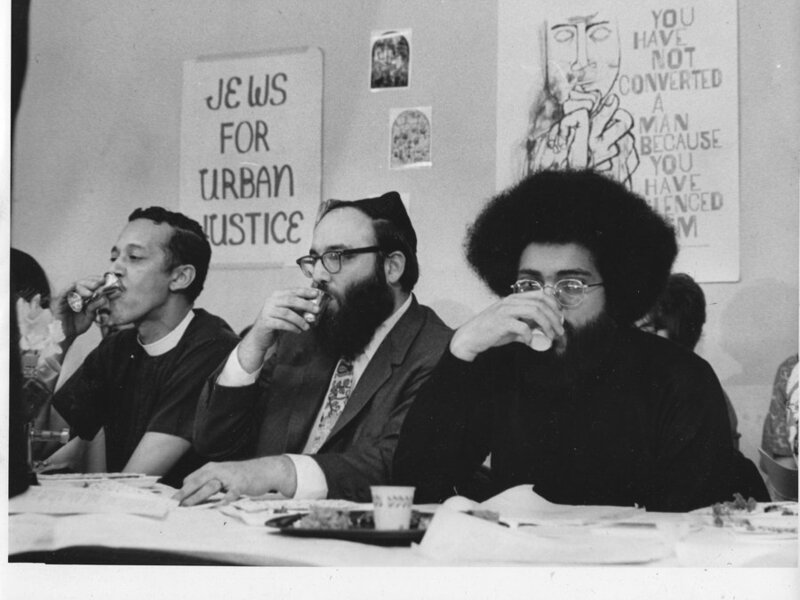 Channing E. Phillips, (left) Rabbi Arthur Waskow, and Topper Carew on April 4, 1969, the night of the first Freedom Seder. 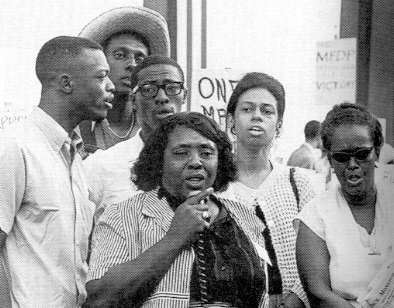 Fannie Lou Hamer’s freedom songs returned to Waskow in 1968, after Martin Luther King’s assassination, when Washington and many other cities responded with “riots”. Like Tichenor, Waskow puts the term “riot” in quotation marks. He sees the response of the black community as an “uprising” against the politic and the American political system. It was the week before Passover, the only holiday that Waskow’s secular-leftist parents had celebrated when he was a child. As he walked home, he saw a tank on the streets of his neighborhood with the gun trained in his direction, and he thought, “This is Pharaoh’s army.” From that one thought came Waskow’s first “Freedom Seder” which was held in the basement of a black church on the anniversary of King’s death in 1969. Linda Hunt Beckman made the connection most explicitly. The product of a family that attended a Conservative synagogue and kept the dietary laws, they also were involved with the labor movement. She’d participated in the Youth March for Integration in 1958 when she was in high school, and had picketed Woolworth’s as part of the Movement as well as going to Maryland to take part in a Freedom Ride. But when it came to going to the deep South in 1964, she says, “my mother wouldn’t let me.” By 1968, she was married when she saw an advertisement at the university where she taught, calling for researchers to go to Alabama and gather information on malnutrition among black share-croppers. She was a researcher in Alabama in 1968, gathering information on malnutrition among black share-croppers. She and her husband were based in the tiny peninsula hamlet of Gee’s Bend. This black community was the product of the New Deal, a cooperative of basic homes where farmers owned small plots of land. The town’s independence made it a Movement center. The people of Gee’s Bend could take risks because they knew they had nothing to fear from those in power; they could depend on each other. Now 72, and living in Chestnut Hill, Beckman looks back and wonders: why had she felt so comfortable in Gee’s Bend? Then she remembered: she had spent eight years as a camper and at Bronx House, and then as a counselor at Camp Hurley—both left-wing Jewish summer camps. They prepared her to find what the Movement calls “the beloved community” a circle of trust where brothers and sisters worked together to create a world that was a reflection of their commitment to each other. They showed her that it was possible. Ellen Tichenor agrees. In her work in Freedom Movement, she discovered there was a passion born of spiritual strength. She identifies with Judaism now because there are people “who identify with it who identify with me.” On a recent trip to Israel and Palestine, where she was repulsed by much of what she saw—particularly Jews who would take the harm people have done to them, and do it to someone else. Yet at the same time, in that context, she felt deeply Jewish. 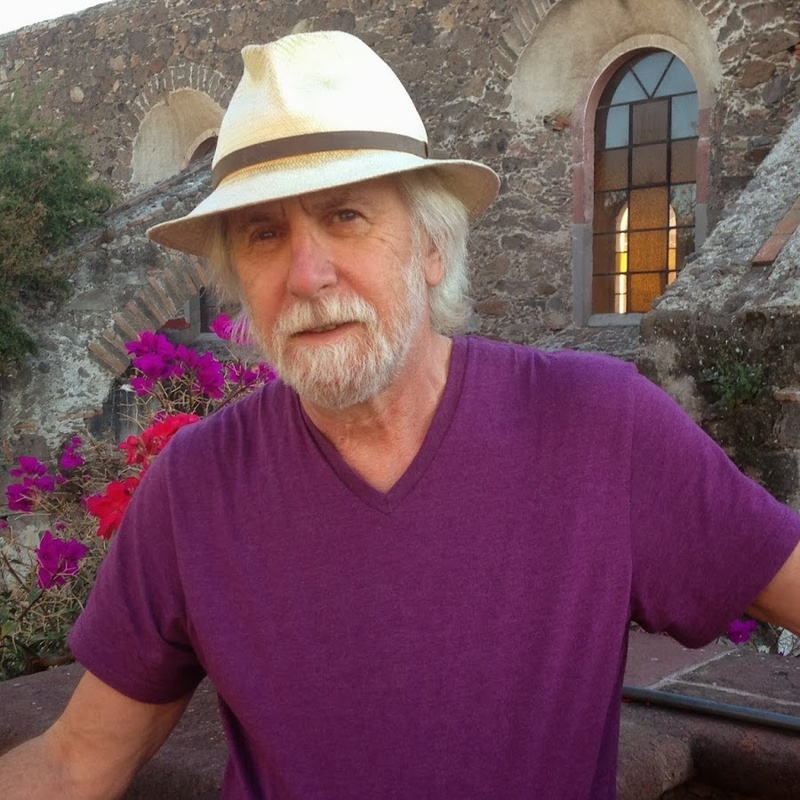 “The civil rights movement gave us a way to see what is possible among people,” says Tichenor. “what to aspire to as humans.” We can take the meaning that life has and apply it to the continuity of Judaism. That is an identity she is proud to claim. Thank you. I enjoyed reading your latest Post. Look forward to seeing all of you on Sunday!